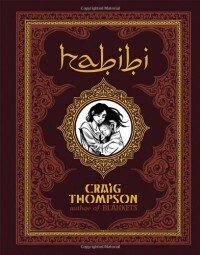 Craig Thompson has created something complex and conflicted and contradictory and very lushly drawn. His fascination with Islamic culture is inked across every detailed and luminous page while his story has elements of a parable to it that can make the characters feel more like authorial devices at times than fully realized and fleshed out characters. The corruption of society and personality has always been in Thompson's work, and this mammoth book (600+ pages) touches those themes over and over in different ways though sometimes the serendipitous elements rub rawly against the modernist critique.